There are numerous short and long(er) walking routes on the Island. Furthermore, the Island of Mljet has also 43 km long recently established a dedicated hiking trail that is split into four shorter routes which you can complete in succession, one route a day. 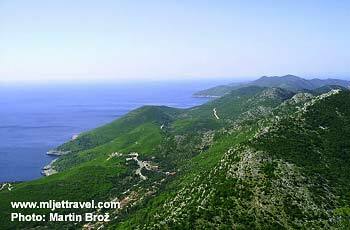 The trail features great views over the Island and neighbouring sea channels as well as over Peljesac (the peninsula that is visible from northern slopes, partly runs parallel with Mljet) and Lastovo the island that is visible from the southern slopes. All four routes are clearly marked with distinguished signs at 20 checking (control) points along each route. The map of the whole trail is available from Mljet Tourist Information Centre which you can get once you arrive on the island. Mljet National Park Accommodation - Book Now! If you prefer to have your map in advance there is a much more detailed map you can buy it online. This map is definitely the best map you can get anywhere. It is real hiking map (1:25.000) with very good markings and details – just right format for hikers who prefer to plan their own routes over sticking to suggested hikes from guidebooks or local tourist offices. Walking Route 1 – a starting point for this route is in Pomena. This is a semi-circular route (see above map) that involves hike along Nothern part of National Park, passing and overlooking bays of Liskovje, Stupa, Bijela, Zaklopatica and Rogac, proceeding to the village of Govedjari. It takes an estimated 5 hours of walking. The whole walk is within the National Park boundaries. (See some historical photos of walking around Mljet). 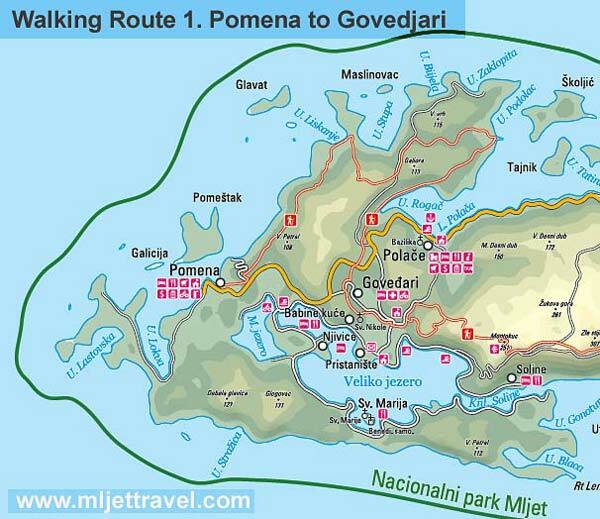 You can also see this part of the walk is the Map of Mljet National Park. 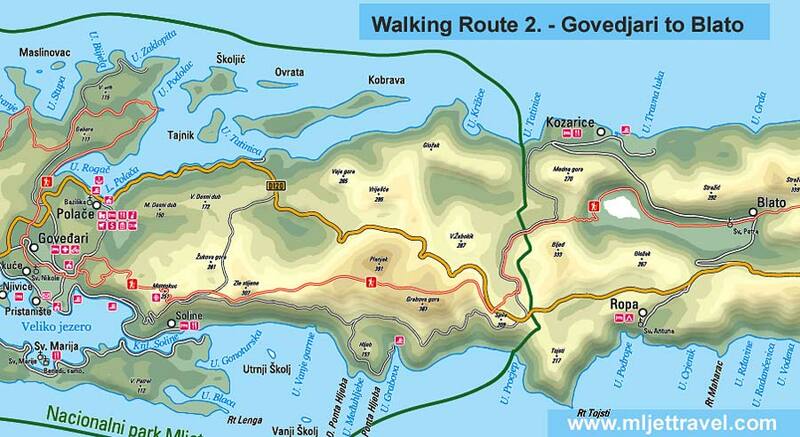 Walking Route 2: The starting point for this route is in Govedjari. This is a linear route (see map above) that connects Govedjari and Blato. It takes an estimated 7 hours of hilly walking. The first part of the route is within the National Park boundaries, while the final bit of the route proceeds out of the Park. Walking Route 3: The starting point for this route is Blato (a village in the centre of the Island). The route is also linear, proceeding from Blato via Rogovici to Babino Polje (see above map). It takes about 6 hours to complete this, mainly flat route. The whole walk is out of National Park boundaries. 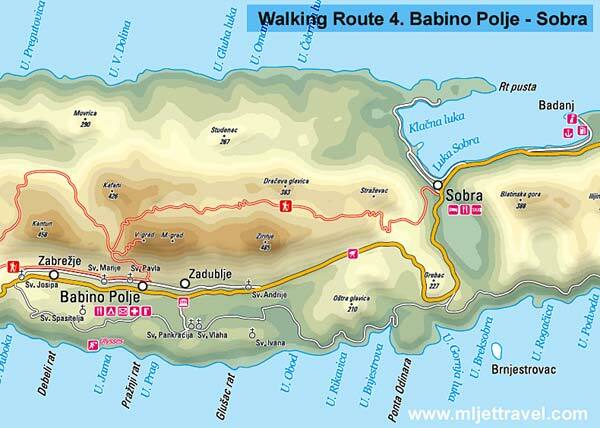 Walking Route 4: The starting point for this route is Babino Polje. The route is also linear, proceeding from Babino Polje via Veliki Grad (the very steep hill that offers great views) to the bay of Sobra (see above map). It takes approx 6 hours to complete this walk. The whole route is out of National Park boundaries.